PWA has quickly evolved from a mechanical recording with a slow response time in the 19th century to the current digital, highly accurate and noninvasive method of recording both peripheral and central pulse profiles that it currently is. Throughout the process of innovation, the objective has been to measure, quantify and share information. The following guide outlines the development and clinical applications of pulse wave analysis. The information herein is based on current global experience and discusses the methods for using he technology in the management of a range of macrovascular, hypertensive and cardiac problems. Heart failure is the number one killer of adults in the developed world and the only cardiovascular disease that is increasing in occurrence and prevalence. It is typically thought of as a disease of the elderly, causing the most hospital admissions among that age group in United States. Heart failure occurs when the heart is unable to pump sufficient blood to the metabolizing tissues or can only do so in the presence of elevated end-diastolic volumes and/or pressure. This condition is called ventricular dysfunction and there are two types: systolic and diastolic. Systolic heart failure is characterized by the impairment of myocardial contractility which leads to decreased stroke volume. During systolic heart dysfunction, there is inadequate ventricular emptying and dilation. Using the PWV system, specialists are able to measure aortic and systemic stiffness which illustrates the impact of arterial stiffness on the heart. These readings permit quick and effective management of conditions such as hypertension. The measures also enable early intervention before the condition is allowed to progress into diastolic heart failure. Diastolic heart failure is characterized by the impaired relaxation of the ventricle and increased resistance to ventricular filling. This delayed relaxation and increased stiffness prevents the heart from filling properly during diastole, particularly when the heart rate rises. During diastolic heart failure, the left ventricular ejection fraction is >0.50 in the absence of major valve disease. This symptom is exacerbated by any ischaemia. The probable cause of diastolic dysfunction is increased aortic stiffness. This results in a lower tolerance for exercise and eventual diastolic heart failure. Data from the Framingham study concurs, suggesting that 91% of patients who developed heart failure were previously afflicted with hypertension, characterized by gross elevation in pulse pressure as a result of arterial stiffening. While diastolic dysfunction is characterized by impaired left ventricle relaxation, there is also an increase in total systolic time that can be attributed to the systole prolongation. Conversely, during systolic heart failure the total systolic time is decreased. This change in timing is a practical measure used to identify diastolic heart failure separately from systolic failure. Factors which contribute to left ventricle diastolic failure include stiffened arteries, hypertension, ischaemia, diabetes and myocardial changes with or without associated hypertrophy. An increase in aortic stiffness produces an increase in aortic and left ventricle systolic pressure, an increased demand for myocardial oxygen and LV hypertrophy, compromised coronary perfusion and a decrease in aortic pressure. The treatment strategies for systolic and diastolic heart failure differ from one another so it is important to distinguish between the two, however, clinical characteristics alone cannot accomplish this. The PWV System enables this differentiation through an analysis of cardiac cycle timing. The PWV System analyzes aortic waveform and provides measures of the left ventricular load, coronary artery perfusion pressure and central pressures. The objective of treatment is to improve exercise tolerance and relieve symptoms so the PWV System gives specialists the measurements necessary to monitor and manage the therapeutic regimen. Chronic kidney disease (CKD) or chronic renal insufficiency (CRI) is the result of losing kidney function. As the disease progresses, many people with CKD may develop permanent kidney failure or end stage renal disease (ESRD). At this later stage in the illness, only dialysis or transplantation are the remaining treatment options. In addition to this prognosis, it has been observed that subjects with renal disease have a high risk of suffering a fatal stroke or heart attack. The PWV System is valuable to this cross-section of patients as it shows and tracks the progress of macrovascular disease as it relates to developing cardiovascular disease. As such, it is an important tool for early detection of high-risk subjects and the management of the illness. Studies show that cardiovascular disease is the primary cause of death in patients suffering from chronic kidney disease (CKD) and end stage renal disease (ESRD). It follows that prevention and/or treatment of CV is a critical goal for these patients. •	Diabetes and hypertension are the most common causes of ESRD: 77% at 1 year to 9% at 10 years. The high risk of cardiovascular disease in subjects with CKD and ESRD can be partially attributed to a stronger presence of other cardiovascular risk factors such as high blood pressure, high cholesterol, diabetes and low activity levels. However, these factors alone do not completely explain the high mortality rates among ESRD patients. Currently, the strongest predictor of cardiovascular death in haemodialysis patients is the structure and function of the larger arteries. With increased arterial stiffness comes an increase in central systolic pressure and therefore a greater cardiac workload. The arterial stiffness changes the pressure profile at the heart thereby contributing to the development and advancement of conditions such as hypertension, LV hypertrophy and dysfunction and myocardial perfusion. All of these factors are present in CKD and ESRD patients and the PWV System, through enables their assessment using the Aortic BP Profile Analysis and Pulse Wave Velocity modules. Aortic pulse wave velocity (PWV) and more significantly Augmentation Index (AIx) are known predictors of morbidity in ESRD patients on haemodialysis. These values provide information into mortality and risk independent of other known risk factors. In a patient study group of ESRD subject, an increase of 10 in AIx (%) produced a 5% increase in the risk of cardiovascular and all-cause mortality. In addition, any increase of PWV of 1 m/s showed a subsequent 39% increase in adjusted overall mortality. The characteristics of this patient group included ranges for AIx of 26 ±15 and PWV of 11.7 ±3.0 m/s. All of these findings were independent of other known risk factors including brachial BP. Studies show that arterial stiffness in ESRD has widely attributed to vascular calcification. A link has also been found between the presence of vascular calcification and increased arterial stiffness in dialysis patients. Additionally, as the aortic PWV increases, so too does the degree of coronary artery calcification. This finding is significant because calcifications may be a preventable factor in the development of arteriosclerosis in ESRD patients. Recently, studies have also shown that children on dialysis exhibit major abnormalities in arterial walls and consequently, stiffened large arteries. This finding is shown by increases in AIx and PWV, demonstrating the importance of using these markers in paediatric nephrology to assess and monitor cardiovascular risk. While increased aortic stiffness (PWV) and systemic arterial stiffness (aortic Augmentation Index – AIx) have readily been shown to correlate with other conditions prevalent in patients with CKD, hypertension, diabetes, atherosclerosis and hypercholesterolaemia there is less documentation linking arterial stiffness to high rates of cardiovascular death in CKD patients. Recent studies do indicate that arterial stiffness is associated to pre-dialysis CKD patients with mild renal impairment. As well, it has been shown that increased arterial stiffness is associated to the decrease in renal function as evidenced by decreasing glomerular filtration rate. Increasingly, studies are demonstrating the effects of various factors such as drugs, salt and water overload, kidney transplantation and exercise on arterial stiffness in renal and hypertensive patients. In fact, the PWV System has recently been used to analyze the effect of dialysis on endothelial function in renal patients. These applications and linkages highlight the potential of PWV to illustrate the effects of therapies and regimens through central blood pressure, changes to the aortic and systemic arterial stiffness, as well as endothelial function changes. The PWV System shows potential for playing an integral role in both detection and therapeutic management for patients at every stage of kidney disease. Arterial stiffness and accelerated wave reflections that lead to increased heart pressure have been linked to many of the other common cardiovascular illness risk factors such as high blood pressure and obesity. More importantly, studies show that central systolic pressure and arterial stiffness are predictors of cardiovascular morbidity and mortality independent of the usual risk factor or other contributors such as brachial systolic blood pressure. The measures of systemic and aortic stiffness generated by the PWV system (i.e. aortic augmentation index and pulse wave velocity) have been linked to conditions with a high incidence of cardiovascular risk. These parameters have also been independently associated to all-cause and cardiovascular mortality in subjects with end-stage renal failure. In hypertensive and diabetic patients, AIx and PWV have also been shown to be significant predictors of coronary artery disease and cardiovascular morbidity/mortality. Research shows that arterial stiffness produces a rise in myocardial demand and central systolic pressure coupled with a fall in coronary artery perfusion pressure. This physiological occurrence drastically increases the risk of heart attack, stroke and heart failure. The PWV System facilitates a thorough and informed risk assessment by analyzing the blood pressure profile at heart level and assessing the structure and function of arteries. It is widely recognized that age is an important determinant of cardiovascular events. As arteries age, they become increasingly stiff and dilated. This structural change causes an increase in systolic blood pressure and pulse pressure which may eventually lead to hypertension, specifically isolated systolic hypertension (the most common form in the senior citizens). Studies show a positive correlation between arterial stiffness (aortic PWV and AIx) and age. This relationship also exists for central pressure pulse (PP) and augmentation pressure (AP), however, AIx and PWV exhibit a different pattern than the former. Central PP and AP increase linearly with age while changes to AIx are more prominent in people below age 50 and changes in PWV are more significant in people over age 50. Since an increase in arterial stiffness leads to an increase in augmentation pressure and systolic pressure, it is recommended that PWV and PWA measures be taken to fully assess the impact of age on arterial health. The PWV System includes reference ranges to crosscheck patients with normal age and gender-specific measures. Height is said to play a role in the risk for developing cardiovascular disease. In individuals of short stature, there is a shorted path length for pressure waves to travel and the reflected waves arrive back earlier in the cardiac cycle. This causes an increase in systolic pressure and LV afterload. Women tend to have a higher level of arterial stiffness than men. Some studies suggest that height is the underlying cause of this gender difference as women are typically shorted in stature than their male counterparts. However, even when correcting for this height factor, gender still plays a role in predicting arterial stiffness. Smoking has an immediate affect on central blood pressure, endothelial function and vasoconstriction. As such, cigarette smoking is a significant risk factor in the development of cardiovascular disease, even among young people. Regardless of gender, height, health or fitness levels, AIx readings are dramatically higher in smokers. Even occasional smokers exhibit these higher-than-average results with studies showing that secondhand smoke has only a slightly less detrimental effect on arterial stiffness as chronic smoking. Important to note is that despite the significantly high AIx readings, brachial BP measures tend to be low in chronic smokers due to poor pressure amplification, giving an inaccurate picture of overall health. The PWV System provides a wider view and deeper insight into aortic pressures and arterial stiffness. The rate and prevalence of obesity among children and adults is rapidly becoming a global issue. Over 60% of adults in United States are overweight and the number of children and adolescents who are obese is quickly rising. The linkages between obesity and cardiovascular disease are well established in addition to the association with other conditions such as diabetes, hypertension and sleep apnea. Recently, obesity has also been linked to arterial stiffness with central adiposity being a significant factor in AIx. This relationship is independent of other health factors like age or blood pressure. It now recommended that body fat distribution, as opposed to body weight, be considered when analyzing arterial stiffness. In addition to arterial stiffness, a relationship between obesity and aortic PWV has been shown to exist. A recent report showed median aortic PWV readings that were 4 to 9 m/s higher in the obese than those within a normal weight range. In addition, the PWV has shown an independent relationship between obesity endothelial dysfunction. After weight loss, significant improvements to vascular endothelial function were observed. The primary lifestyle change prescribed to obese patients is an increase in exercise. Physical activity has been shown to decrease arterial stiffness both in sedentary subjects as well as in those suffering from coronary artery disease or end stage renal failure. The effect of exercise is far-reaching. It improves arterial stiffness thereby reducing the potential for myocardial ischemia. In addition, exercise shows the potential to alter the natural progression of age-related arterial stiffening. Studies of athletes indicate a lower arterial stiffness than their sedentary counterparts. This difference has been attributed to regular exercise. A relationship between high blood cholesterol levels, high central pulse pressures and systemic arterial and aortic stiffness has been shown to exist. This association is significant even despite a low peripheral blood pressure. In addition to this link, LDL cholesterol is an independent determinant of arterial stiffness (shown by a rise in AIx). It has been determined that lowering cholesterol levels causes a reduction in arterial stiffness as well as a drop in cardiovascular and all-cause mortality. Statin drugs are prescribed to reduce aortic PWV and pulse wave analysis is currently being used in a sub-study of the SEARCH (Study of the Effectiveness of Additional Reductions in Cholesterol and Homocysteine) trial to determine if there are benefits to arterial stiffness in addition to the known benefits to lipid lowering. A healthy diet goes hand in hand with good health however, understanding the physiological effect of ingested substances is key. Several foods and drinks influence the cardiovascular system and promote arterial stiffness or lead to cardiovascular risk. The following dietary items have demonstrated a significant affect on the arterial stiffness and central blood pressure. Caffeine is the most widely used and socially accepted pharmacological substance in the world. Studies show that ingesting coffee produces an increase in central blood pressure while drinking decaffeinated coffee has no effect, thus, caffeine is the active ingredient. An immediate and significant association exists between central systolic pressure, AP, AIx and coffee consumption, without any increase in brachial blood pressure. In hypertensive patients, this detrimental effect of caffeine is worsened, producing aortic stiffness that lasts up to 3 hours long. For patients that already exhibit a stiffened aorta, this effect is further exacerbated by caffeine with little to no protection coming from anti-hypertensive medication. Caffeine use produces a detrimental on arterial stiffness and, as a result, on left ventricular load. In addition to the known effects of caffeine, when combined with smoking, it produces a synergistic effect on arterial stiffness. For these reasons, it has been suggested that caffeine intake be taken into account when assessing cardiovascular risk. The relationship between alcohol consumption and cardiovascular risk is ‘U’-shaped: heavy drinkers and non-drinkers are at the high end of the risk while moderate drinkers are in the middle, with lower risk. This same relationship exists between alcohol consumption and arterial stiffness. For example, moderate consumption of red wine in patients with coronary heart disease produces favorable effects to central systolic pressures and wave reflections with no changes to brachial blood pressure. Interesting to note is that a similar result was observed with non-alcoholic red wine. The study, therefore, demonstrates the necessity of measuring central pressures as compared to conventional blood pressure while assessing the risk potential of various substances. Dark chocolate contains antioxidants called flavonoids that reportedly benefit the cardiovascular system. Incorporating foods high in flavonoids is recommended in order to decrease arterial stiffness and wave reflections (AIx). Dark chocolate has also been found to exert a positive effect on endothelial function. These benefits suggest an overall positive influence of dark chocolate on the cardiovascular system. Pregnancy produces a host of physical changes in a woman’s body including changes to the cardiovascular system. It is not uncommon to develop hypertension while pregnant but the condition can lead to major complication for mother and child if eclampsia develops. 1. Chronic: Onset of this type of hypertension takes place before the pregnancy or 20 weeks prior to gestation and may develop into eclampsia. 2. Post pregnancy: This type of hypertension develops 20 weeks after gestation and can develop into preteninuria, multi-organ dysfunction (pre-clampsia) and seizures (eclampsia). If the pregnant patient has pre-existing hypertension, this doubles the risk of developing preeclampsia as well as other issues such as placental abruption and growth restriction. Severe cases of hypertension increase the risk of preeclampsia by 46% as well as leading to an increased potential for maternal and fetal complications. Studies suggest that over 50, 000 women worldwide die each year from preeclampsia and maternal morbidity due to permanent CNS damage from recurrent seizures or intracranial bleeds and renal insufficiency. About 5% of pregnancies in the U.S. and U.K. are complicated by preeclampsia and of this 5%, 1 to 2% develop eclampsia. The rate of preeclampsia is further increased in women of low socioeconomic status, extremes in age and women experiencing their first pregnancy. The risks to the fetus include premature birth, placental infarcts, intrauterine growth retardation, abrupted placenta, and fetal hypoxia. While preeclampsia cannot be prevented, mortality can be avoided with early diagnosis, monitoring and treatment. Hypertension is a significant predictor in preeclampsia and assessing this condition in pregnant women could lead to early diagnosis. A recent study showed that over the over 250,000 women studies, those with gestational hypertension were at a 30% greater risk of developing preeclampsia and those with existing preeclampsia showed a staggering 400% higher risk of death or major morbidity compared to those without hypertension. In addition to these pregnancy concerns, the babies of women with hypertension are more likely suffer adverse effects than babies of women without hypertension. Currently, brachial blood pressure is the standard measure by which pregnant women are assessed throughout the pregnancy. This type of measure is not sensitive enough to differentiate between the various types of hypertension nor is it able to identify patients at risk of developing preeclampsia. Clearly, the need to identify at-risk patients and distinguish between hypertensive disorders is crucial to managing these issues and improving the prognosis for both mother and child. Studies show that arterial stiffness is a primary cause of hypertension. Recently, researchers have been looking into the relationship between arterial stiffness and cardiovascular complications in pregnant women. The typical cardiovascular response to pregnancy in a healthy female is an increased heart rate, lowered brachial blood pressure (due to the dilation of peripheral blood vessels), the expansion of blood volume and a rise in endothelial nitric oxide release. Additionally, aortic AIx is typically lower during each of the trimesters as compared to non-pregnant women. Arterial stiffness causes a premature return of the reflected pressure wave in arteries. 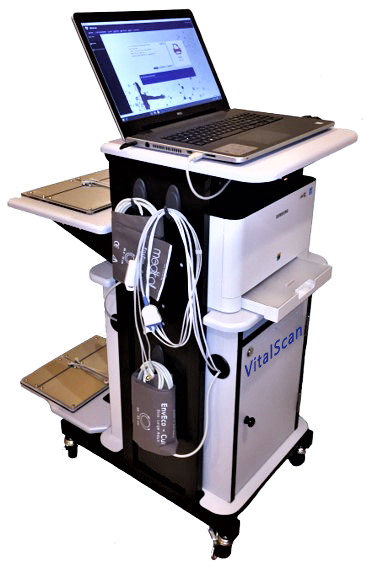 The PWV System measures increased arterial stiffness by observing the rise in aortic pulse wave velocity (PWV) and to the aortic augmentation index (AIx). By measuring the changes in AIx, the PWV System provides important insight whether or not the changes exhibited in aortic AIx are normal or a cause for concern. Women with gestational hypertension tend to have higher aortic AIx values in their third trimester than non-hypertensive, pregnant women and these values increase in women with preeclampsia. Six weeks after giving birth, the aortic AIx values drop to normal, non-pregnant levels. By the same token, research suggests that aortic stiffness is higher in the presence of gestational hypertension and preeclapsia. As such, the readings for AIx and aortic PWV provided by the PWV System are important for establishing a distinction between women with gestational hypertension and those at risk for progressing to preeclampsia. Even in normotensive pregnancies, a low birth rate has been found to correlate to maternal aortic PWV. Aortic PWV readings of 1 m/s are associated to a decrease in birth weight centiles of 17%. Birth weight centiles are a crucial measure of pregnancy outcome and provide insight into potential fetal issues in antenatal assessment. It may appear that arterial stiffness is a reflection of poor plasma volume expansion even in normotensive pregnancies and this could hinder fetal growth. Identifying and distinguishing between gestational hypertension and preeclampsia is a measure easily accomplished by the PWV System. In addition to these important analyses, the PWV System provides valuable insight into a patient’s ability to adapt to pregnancy-related vascular changes. These readings give doctors a broader assessment of health which leads to better risk management and monitoring during pregnancy. With heart disease being the number one cause of death among adults, it is crucial to manage factors that contribute to its onset. Diabetes and, in particular Type 2 diabetes, increases the risk of heart disease and stroke due to their associate risk factors such as high blood pressure and high cholesterol. The long-term complications of diabetes are far-reaching and affect many parts of the body. These issues include nerve damage, blindness, kidney failure, stroke and heart and vessel disease. Early identification and symptom management of macrovascular disease are essential for diabetic patients. The PWV System assesses risk and helps to track the progress of cardiovascular complications in a noninvasive, easy-to-use application. Diabetes is said to affect over 20 million people in the United States alone. Of this 20 million, 14 million have been diagnosed and another 6 million are living with the disease but have yet to be diagnosed. Around 1 million people over the age of 20 are diagnosed with diabetes each year. The survival rate for diabetics who develop heart disease is 40% and this risk is 2-7 times higher in those patients with Type 2 diabetes. The linkage between diabetes and cardiovascular disease is well documented. In addition, diabetes has been shown to be among the primary causes of end stage renal disease, a condition that also leads to cardiovascular disease. The relationship between diabetes and a higher risk of cardiovascular events may be, in part, attributed to the other known risk factors (i.e. hypertension, dyslipidaemia, hyperglycaemia and obesity) associated with diabetes. That said, these factors cannot completely account for the link because some of the increased risk is independent of these issues and varies depending on the type of diabetes. What is clear is that increased arterial stiffness is associated to both Type 1 and Type 2 diabetes and may also contribute to the high mortality rates. The PWV System provides insight into arterial stiffness which presents a valuable tool for assessing cardiovascular risk in diabetics. The parameters measured by the PWV System include peripheral pulse pressure and aortic stiffness. Peripheral pulse pressure assists in the assessment of arterial stiffness and has been show to correlate to diabetes. Studies show that age-related blood pressure increases progress 15-20 years in Type 1 diabetes. This finding suggests accelerated vascular aging, a precursor to cardiovascular illness. Pulse wave velocity, as collected by the PWV System, measures aortic stiffness and is an independent predictor of mortality in diabetic subjects. This parameter indicates that every m/s rise in PWV produces an 8% increase in risk of mortality. The increased aortic PWV and augmentation index (AIx) lead are associated to both types of diabetes. A recent assessment in the FIELD (Fenofibrate Intervention and Event Lowering in Diabetes) Study illustrated a clear linkage between augmentation pressure (AP), AIx and carotid IMT (a known predictor of atherosclerosis in Type 2 diabetes patients). This finding suggests that arterial stiffness may play a role in the advancement of atherosclerosis in Type 2 diabetics. More significantly, this finding suggests that an assessment of central blood pressure and arterial stiffness offer superior potential as determinants of arterial thickening in Type 2 diabetics versus traditional methods. Research into AP and AIx is ongoing and expected to to provide further insight into the predictive value of these measures as they relate to cardiovascular events in diabetics. AP and AIx are also significantly associated to carotid IMT and plaque score patients suffering diabetes as well as coronary arter disease. In addition, the CURES (Chennai Urban Rural Epidemiology Study) study as conducted on Asian Indians (a subsection of south Indians at high risk for developing diabetes and coronary artery disease) demonstrated higher AIx and IMT values for Type 2 diabetes patients with retinopathy as compared to those without. This recent finding suggests a strong correlation between early atherosclerosis and diabetic retinopathy. Increase arterial stiffness is known to produce an increase in central systolic pressure which, in turn, raises the myocardial demand. The increase in cardiac workload is directly related to arterial stiffness and may result in further cardiovascular-related conditions such as hypertension, left ventricular dysfunction and a decrease in myocardial perfusion. The development and advancement of conditions like these is avoidable with proper identification and monitoring. The PWV System uses pulse wave analysis and pulse wave velocity measures to assess parameters such as arterial stiffness, AIx and PWV. The information is gathered in a simple, noninvasive manner and once collection, the data is highly valuable in the assessment of existing conditions and prescription for future therapeutic programs. Customized drug treatment programs have been shown to decrease arterial stiffness in patients with cardiovascular disease, including diabetics. These timely pharmacological interventions have been shown to be effective independent of changes in cuff blood pressure. While insulin has been observed to decrease AIx independent of peripheral vascular resistance, this effect is not present in diabetics (Type 1 or Type 2) or obese patients with insulin resistance. Pharmacological interventions which have proven successful in decreasing arterial stiffness include the oral administration of ascorbic acid over a 4-week period. Using the PWV System, doctors are able to monitor the efficacy of particular drug regimens by measuring changes in central cardiac parameters. This application assures physician’s a reliable patient risk assessment and accurate measure for tracking treatment and managing patient health. Arteries may become narrowed due to a build-up of a fatty substance called plaque. As the plaque coating the arterial wall accumulates and hardens, the arterial opening becomes smaller, or occluded. This process is referred to as stenosis. When it occurs in the legs and feet, the condition is called lower extremity peripheral arterial disease and it causes pain, poor healing, and in some cases, tissue death. This disease is one way in which atherosclerosis is experienced among the 35% of Americans who suffer from the condition. Other ways in which atherosclerosis is manifested in patients includes other cardiovascular issues such as heart disease and carotid artery disease. What Are the Risk Factors and Symptoms for Peripheral Arterial Disease? The most significant risk factor for developing lower extremity arterial disease is smoking. Smoking is, in fact, the primary risk factor for every cardiovascular disease. Other contributing factors include a family history of atherosclerosis, diabetes, high blood pressure and/or high cholesterol, a sedentary lifestyle, and age. Physicians determine the location and degree of arterial stenosis using imaging tests such as a magnetic resonance imaging (MRI) or angiography. They measure the severity of stenosis and loss of blood flow by comparing blood pressure reading from the ankle as compared to readings from the arm. This test is referred to as the ankle brachial index (ABI). What Are The Treatments For Peripheral Arterial Disease? Treatments available to patients with peripheral arterial disease depend upon the severity of their condition. For mild to moderate symptoms, lifestyle changes such as increased exercise of quitting smoking are often enough to improve the condition. Doctors may also prescribe a treatment program of blood-thinning drugs or other medications to assist with related conditions such as high blood pressure, high cholesterol and diabetes. For more advanced stages of the disease, doctors will prescribe more invasive procedures such as balloon angioplasty or stents to physically improve blood supply and widen the arterial opening. These treatments are administered in cases where the diseased area of the artery is relatively small and easily accessible. While initially effective, blockage return with a year or two in about 30-40% of patients treated with an angioplasty or stenting. This return of blockage is called restenosis. This diagnostic imaging test gives doctors a window into the state of blood vessels. An angiogram conducted on arteries is called a arteriogram while one conducted on the veins is a venogram. In any case, dye is injected into the vessels using a flexible, hollow tube called a catheter. The catheter administers dye to through a needle puncture in the groin area. The dye renders the blood vessels visible by x-ray which enables easy viewing and diagnosis of blockages, clots, enlargements and other abnormalities. The doctor may use an angiogram in combination with any of the following treatments including balloon angioplasty, stenting, atherectomy, cryoplasty, or laser treatment. The catheter is tipped with a specialized balloon then inserted into a blood vessel in the groin area. The catheter is guided to the affected area of the artery then the balloon is inflated. The inflation causes the plaque to compress against the arterial wall thereby decreasing the blockage and opening the artery. Depending on the extent of blockage, a more permanent solution may be prescribed. For these situations, a small mesh support tube called a stent will be used to reinforce the arterial opening. The stent is inserted using the balloon-tipped catheter. Following inflation, the stent will remain in the artery to assist with flood flow and maintain the newly-enlarged opening. In some cases, the stent will be coated in medication to prevent the formation of scar tissue. An atherectomy is performed n conjuction with an angioplasty to remove plaque lining the arterial wall. The atherectomy device is inserted into the artery using catheter. At the site of the arterial blockage, a rotating blade or burr is activated and begins grinding down hardened plaque from the interior walls. The catheter then suctions the loosened plaque out of the body. A balloon angioplasty is performed to expand the arterial wall. A freezing compound is then used at the blockage site. The freezing action causes the plaque to solidify and shatter in smaller, uniform pieces. This process is said to said to stave off restenosis. The catheter is tipped with a specialized laser then inserted into the artery. At the blockage point, the laser emits a pulsating laser beam which vaporizes the plaque. For severe cases of arterial disease, a leg bypass procedure is recommended. The bypass involved reconstructing a new blood vessel in the leg in order to improve blood flow, promote wound healing and relieve any associated pain in the legs or feet. The arterial pulse in infants shows the same contour in central and peripheral arteries. This finding is similar to what is observed in the elderly. While the amplitude of infantile arterial pulse is low, it shows no secondary wave in diastole and the wave’s peak is observed in late versus early systole. As subjects grow into adolescence, the contours observed in arterial begin to change. The peripheral pulse is amplified, the wave peak shifts to early systole and the secondary diastolic wave is now obvious during early diastole. These changes to the pressure wave contribute to the significantly higher peripheral pulse pressure and systolic pressure experience in late adolescence versus infancy. The similarity in pressure pulse waveform between infants and the elderly can be attributed arterial structure and its effect on wave reflection. In infants, wave reflection from peripheral to central vessels is short due to their relatively short length of the infant’s body, even though the aorta is very compliant at a young age. In the elderly, body length isn’t the significant factor; however, aortic stiffness produces the same effect on the reflected wave velocity. Despite their short bodies and quick heart rate, infants show a relatively long LV ejection period. During research, animals of similar size and heart rate indicate a significantly shorter LV ejection rate and secondary reflected waves are noticed in diastole versus systole. This transfer function for producing increasing aortic pressure waves is illustrated in adults rather than children. The shorter body length of younger people affects wave travel and reflection significantly. The pressure pulse waves are affected in the upper body as well as the lower limbs, wherein most reflection originates. Dating back to Mahomed’s initial observations, age has been found to be significant factor in arterial pulse. Kelly et al. have conducted extensive research on this arterial pulse in normal subjects. Findings show an increase in the late systolic pressure peak in both the radial and carotid arteries. This observation is coupled with the loss of the secondary diastolic pressure wave. In addition, the late systolic pressure wave is found to be lower in the radial artery that in the carotid, regardless of age. Similarly, it has been found that readings from the ascending aorta taken at the cardiac catheterization show the same pulse wave patterns however, late systolic augmentation is greater in the carotid and even more so in the radial artery. Augmentation is defined as the boost to late systolic pressure after the first initial systolic shoulder. This reading is determined by dividing pulse pressure by the pressure to the first systolic should and it is expressed in mmHg. It can also be determined by dividing augmentation by pulse pressure. Augmentation of the aortic wave is measured as 20 mmHg or 159% (or 37% of pulse pressure). Augmentation is said to increase with age. In adolescence, augmentation index is around 100%, with amplitude of the ascending aortic systolic pressure wave approximating the first. This value increases accordingly with age so that elderly people show an augmentation index of about 160% with a radial pressure wave augmentation close to 100% and the secondary pressure wave will have risen to about 40% from adolescence. This trend in increasing augmentation index throughout life is directly related to arterial stiffening, particularly aortic which increases pulse wave velocity. Arterial stiffening causes an early return of the reflection from the trunk and lower body. This reflection takes place throughout the body wherever low resistance conduit arteries join high resistance arterioles. This action has been researched extensively in normal western versus normal Chinese subjects. The Chinese population has a statistically low occurrence of atherosclerotic disease. It has been shown that aortic wave velocity increases by more than double between the ages of 20 and 100 therefore the process of aortic stiffening is a normal ageing response and responsible for the increases observed in pulse pressure and systolic pressure. The process is exacerbated by hypertension and arterial degeneration and may be modified by arterial and cardiac disease. It appears that the ill effects suffered as a result of ageing on the arterial pulse coupled with the lower systolic augmentation of the pulse in various arteries has a detrimental effect on physical fitness. It has been suggested that exercise affects the overall endothelial functioning in the body, causing conduit arteries to dilate, wave reflection to decrease and pulse wave velocity to drop. These effects could produce a decrease in augmentation of the carotid, radial or aortic pulse, however, this relationship has not been established and a dominant mechanism for the observed results has not been determined. It has also been posited that subjects with less aortic ageing may simply feel more comfortable during exercise than those with an advanced condition and therefore are more likely to take part in exercise. Lower augmentation readings in fit subjects may be attributed to improve endothelial function; however a relationship between pulse wave contour and endothelial dysfunction has not been established. Changes in pulse wave velocity and instances of arterial stiffness in the upper limbs are not associated to endothelial dysfunction in the upper limb as observed with age in different diseases. Food consumption of any sort (including drinks) produces a reduction in wave reflection from the splanchnic bed thereby altering the contour of the arterial wave especially the degree of late systolic augmentation. As such, the post absorptive state is preferable for conducting assessments on ageing, drug effects or of the disease in general. Both the pattern and duration of ventricular ejection are affected by heart rate. This, in turn, leads to changes in the contour of the arterial pressure wave as well as the summation of reflected waves as produced during ventricular ejection. It has been found as heart rate decreases, augmentation increases (through an increase in the ejection period) and as heart rate increases (and ejection period shortens), augmentation decreases. This effect, as studied extensively by Gallagher and Wilkinson et al., is attributable for the 4% approximate decrease in aortic augmentation per 10 beats minx1 increase in heart rate during cardiac pacing. Heart rate has also been found to increase amplification of the pulse wave between aorta and peripheral arteries due to the higher amplification of individual harmonics at frequencies near 5±6 Hz. The transfer function of the PWV System allows for this while assessing the ascending aortic from the peripheral pressure wave at various heart rates. Exercise produces an obvious effect on heart rate and is most apparent during tachycardia when pulse pressure in the radial artery may increase to twice as much as in the ascending aorta and radial systolic pressure rises to 80 mmHg or higher. The vertical bodily effect of running causes additional pressure waves to show in the arterial pulse though it appears that in trained long distance runners, a counter pulsation may be experienced wherein heart rate and stride are entrained and the vertical action causes the most significant boost during diastole. If reversed, this phenomenon could have a detrimental effect with diastolic pressure reduced and systolic pressure boosted. Augmentation is highly dependent on height, regardless of age and for every artery. A short stature is a known predictor of cardiovascular disease and differences in height are the primary reason for the variance in augmentation between males and females. Shorter body heights cause an early wave reflection. The resulting increase in aortic systolic pressure augmentation with increased LV load and LV hypertrophy may be the primary mechanism causing the effect. Gender-related differences in augmentation are primarily attributed to the differences in height between men and women. Oestrogens do contribute to arterial stiffness and changes in pulse contour however stature is thought to be the major factor. The most significant factor is arterial pulse is ageing. In all human subjects, aortic pulse wave velocity gradually increases with time as does the progressively early return of the reflected wave. This results in the secondary wave in diastole moving into systole with greater augmentation of pressure in late systole. Late systolic pressure augmentation, caused by early wave reflection is attributable for a 40±50 mmHg boost to systolic pressure in central arteries. At the root of aortic stiffening is the fracture and fragmentation of elastic lamellae within the media. Progressive aortic dilation occurs when stresses are transferred from the elastin in arterial walls to less extensible collagen areas, producing an increase in stiffness. The phenomenon causes a disorganization and dilation in the aorta and arteries in regions of ‘medionecrosis’. This generalized degeneration of medial elements in elastic arteries is referred to as arteriosclerosis. This disease produces a progressive increase in pulse pressure and systolic pressure, otherwise known as isolated systolic hypertension. Systolic hypertension may have the same affect on pressure wave changes as ageing; however the accelerated aortic degeneration would take place at an earlier age. This effect of hypertension is easily explained by increased stiffness and accelerated pulse wave velocity in the aorta. While acute, it is reversible. This change in arterial pulse combined with increased amplitude in the secondary systolic pressure wave in the radial artery was cited by Mahomed as compelling proof of elevated arterial pressure. For over 20 years, Mahomed used this observation in clinical studies until the later Riva-Rocci cuff method took its place. Since distensibility of the brachial artery its radicles is a factor and transfer function doesn’t vary considerably with the elevation of arterial pressure, the transfer method persists as a valid method of generating central to peripheral pressure in the presence of hypertension. There are many studies describing increase in arterial stiffness in patients with coronary artery disease or with other evidence of atherosclerosis. Despite this, and despite our every opportunity, we have not been able to gauge the severity of atherosclerosis on the basis of the arterial pressure wave, and we are not aware that others have been able to accomplish this in prospective studies. We have not been able to show any definite difference in aortic pulse wave velocity in patients with generalized atherosclerosis, and can not propose this as a screening test for atherosclerosis. Neither can others who have studied this possibility. Our own results for aortic pulse wave velocity were virtually identical in populations with low and high prevalence of atherosclerosis. Atherosclerosis must stiffen the aorta, and must contribute to early wave reflection. We are surprised that it has so little effect on measured indices of arterial stiffness, or on the contour of the arterial pulse, which is so sensitive to changes in such indices. It has been cited that diabetes increases arterial stiffness, however, neither the measurement of pulse wave contour nor readings of aortic stiffness help to diagnose diabetes mellitus. Similarly, these measurements have not proven helpful is assessing the extent of the disease. Research indicates that an increase in aortic augmentation in diabetic patients (both Type 1 and 2) does correlate to increases in aortic stiffness. However, it appears that ageing and the effects of hypertension are the primary factors leading to aortic stiffness and changes in pulse wave contour in atherosclerosis and diabetes mellitus. Pulse wave analysis is particularly useful in the screening process to predict heart failure. During LV dysfunction, it has been recognized that ejection duration is prolonged due to a slower rate of calcium re-uptake. This action is often observed in collaboration with left ventricular hypertrophy. This observation has been used to assist in diagnosing diastolic left ventricular dysfunction in subjects suffering from cardiac failure. It is also useful in distinguishing diastolic LV dysfunction from systolic LV dysfunction. Ejection duration is lower during systolic LV dysfunction as a result of the premature wave reflection producing a significant effect on pressure flow. This action contributes to the following functions: presence of a dicrotic pulse during systolic heart failure, shortened ejection duration, minimal to no central pressure augmentation and an apparent wave reflection during diastole. This measure is used to distinguish systolic from diastolic dysfunction as well as gauge the severity of the dysfunction. The capacity to increase ejection duration is correlates to this severity. Glyceryl trinitrate is used to enhance readings through a reduction in wave reflection, increase in cardio output and LV ejection duration and a decrease in LV load. The PWV System provides insight into positive effects of vasodilator drugs through pulse wave analysis. These effects may not be revealed through traditional cuff measures of arterial pressure. For example, a decrease in ascending aortic and LV systolic pressure are the result of a decrease in amplitude of the secondary systolic wave. This phenomenon occurring in the radial artery indicates an antiagninal drug effect that is partially due to a lowered LV load. The PWV System reaches similar conclusion s using aortic pressure pulse in order to quantify the effects of vasodilators. This method conveniently provides other instances of ventricular vascular interaction and is able to identify the secondary systolic shoulder on the radial pressure wave. Observations into the effects of vasodilators on the body are explained by changes in wave reflection. It appears that peripheral systolic pressure is maintained regardless of the drop in central aortic and left ventricular systolic pressure following administration of nitroglycerin. This effect suggests that vasodilators produce a more dramatic effect on the heart than previously assumed (based on observations derived from conventional methods). Since the ascending aortic pressure wave during nitroglycerin infusion can be derived from the radial and the brachial transfer function is minimally changed, we can conclude that vasodilation has a more marked effect on the upper limbs versus the lower body. Synthesized aortic pulse is frequently used to track the therapeutic effects of treatment in angina pectoris, hypertension and cardiac failure. The predominant goal of drug intervention is to optimize ventricular- vascular interaction while decreasing the reflected wave and reducing aortic augmentation, aortic and LV systolic pressure. Vasodilators increase the ejection period by shortening wave reflection, which, in turn, increases stroke volume. As such, ejection duration of the aortic pulse waveform during systolic failure is shortened. The prolonged rate of ejection duration is observed in the carotid, radial and aortic pulse. How much the ejection duration is prolonged is directly related to the degree of cardiac failure. Aortic flow waveform has been used in Japan as a measure of the detrimental effects produced by early wave reflection as observed in aortic flow. It is also used demonstrate how vasodilators successfully reduce wave reflection. In addition, pulse wave analysis shows potential for studying the effect of nitroglycerin on arterioles and peripheral resistance. The efficacy of nitroglycerin is attributed to its method of dilating conduit arteries in order to reduce wave reflections. The present recommended dosages of nitrates combined with sildenafil (Viagra) is of great consideration since these restrictions have been made in the absence of pulse wave analysis. Rather, these recommendations have been made based on a test group whose blood pressure dropped dramatically when administered concurrent doses. Independent studies suggest that sildenafil and nitrates produce a significant reaction when combined. Research indicates that sildenafil potentiates the effect of nitroglycerin by up to twice the intended result and prolongs this effect for as many as 8 hours. The PWV System uses pulse wave analysis to safely track and monitor this drug interaction in order to facilitate titration of nitroglycerin (if required after sildenafil). The arterial pressure pulse provides insight into potential negative effects of drugs. It indicates that b-adrenoceptor blocking drugs typically produce an increase in ejection duration and wave reflection. While uncommon, in some cases, these drugs may cause an increase in aortic and LV systolic pressure as well as an increase in central augmentation. Typically, the positive effects produced by b-adrenoceptor blocking drugs are the result of a disproportionate increase in diastolic, versus systolic, duration with bradycardia. Unlike nitrates, calcium channel antagonists reduce aortic systolic pressure augmentation via vasodilation. This desirable effect is offset by their potential to decrease the diastolic period and prolong ejection duration even in the absence of cardiac failure. By reducing coronary perfusion time, this may contribute to angina pectoris, particularly if tachycardia takes place during the same time. This phenomenon may provide the underlying cause of angina and myocardial ischaemia with short-acting dihydropyridines.